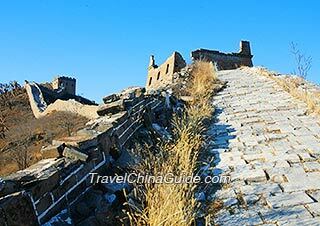 Qiangzilu Great Wall is located in the northeast of Miyun County in the suburb area of Beijing. You can take public bus to get there from downtown Beijing. Firstly, you may reach the Dongzhimen Transit Hub by subway line 2 or 13 (Exit H). Take bus no. 980 Express Line there and get off at the terminal stop, Miyun Bus Station, after 2 hours' ride. Then transfer to Miyun bus no. 16 to Beigou Stop in around 1.5 hours and this one-day Qiangzilu independent tour will start at this point. After alighting from bus no. 16, you are suggested to walk backwards to the Qiangzilu Pass. Only the northern gate is still remained at present. Then, head northwards along a cement road towards Quanshui Village. Follow the path on the left side when you arrive at a fork. Along the way, you will see the ruins of Xiaoguanmen Great Wall built on the low hills at the right side of the road. 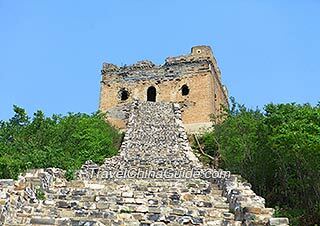 You will arrive at the foot of Qiangzilu Great Wall after about 10 minutes. The layout of the section is in the shape of "V". When you reach the intersection, pick the ramparts leading to the northeast first. You will then pass by the Gaojian Watchtower and finally reach the highest point of this section. After enjoying the full view of the scenery, get back to the intersection and go along the other ramparts down to Mipu Village. Follow the cement road southwards to Quanshui Village and then head for the Beigou Bus Stop. Reverse the trip back to Beijing. This section was built on the mountain ranges, firstly extending to the northeast but takes a 90-degree turn to the northwest at the Datizi Valley, looking like a giant "V" among the rolling mountains. The construction work was ordered by Hongwu Emperor (1328 - 1398). As the first barrier guarding the eastern border of Beijing City in the old times, it was of great strategic importance and had undergone numerous fierce battles. At the intersection, there is a stretch of ramparts still extending to the northeast. It is a unique design which can enable soldiers to outflank enemies and put them in the middle of crossfire. 1. For average backpackers, this independent Qiangzilu Great Wall tour might take at least 6 hours. Make sure you prepare enough snacks and bottled water to help you keep the strength. 2. You are suggested to return to Beigou stop before 17:00 to take bus no. 16 back to Miyun Bus Station, as the last bus no. 980 Express Line leaves for Beijing Dongzhimen Transit Hub at 18:30. 3. From Beigou to Quanshui Village, you will see Xiaoguanmen Great Wall stretching along the road. For your safety, it is not advised to trek along the ramparts as this section has been severely damaged. 3. Lack of enough protection and repair, most parts of Qiangzilu Great Wall are dilapidated, so don't wear slippers, high heels, or sandals. A pair of climbing boots is the best choice.